Get greener and cleaner indoors! These 6 perennial houseplants that clean indoor air will help remove harmful chemical substances from the home or office. It’s no surprise that our air is more polluted than ever outdoors, but unfortunately we are not entirely safe indoors. Furniture, paint, cleaners, and other building materials actually leak chemicals and volatile organic compounds into our indoor air and can create health issues. But houseplants can be used to clean indoor air, whether you’re stuck inside an office all day or can’t open the windows to ventilate your home. These solutions are super easy and very green. The benefit of choosing perennial houseplants that clean indoor air is all about cost. Perennials have a longer lifespand than annuals, so barring an accident, you’ll be replacing your houseplants less often. All plants clean the air by filtering our carbon dioxide and giving us oxygen (nice, those little plant friends! ), but just as important, plants can make a huge difference in the health of our indoor air. Using plants to help improve the air quality is called phytoremediation. Check out these 6 perennial houseplants that clean indoor air. These little green things can improve the quality of air in your home or office, and bring along calm, beauty, and improved creative energy to your space. But first, what is a perennial plant? Perennials are the types of plants that don’t need to be replanted each year. They continue to grow and thrive throughout the seasons. Grasses and roses are examples of perennial plants. Some will need a period of dormancy to rebloom or regrow, while others will thrive year-round at mild indoor temperatures. Annuals are flowers and plants that only bloom or grow for one growing cycle, like lettuce or marigolds. According to Vibrant Wellness Journal, spider plants are, “a grass-like perennial in the lily family and [are] especially popular with beginners. It’s easy to grow and propagate and is very tolerant of neglect. Spider plants are among the best indoor plants for reducing formaldehyde.” Since some people (ahem, myself) have a hard time remembering to water plants, this seems like a great solution. These are beautiful, almost cartoon-like colorful daisies that look great when in bloom, but are also beautiful leafy plants without flowers. Best of all, this widely available and easy to grow plant is effective in removing both benzene and trichloroethylene from the air. Pretty flowers plus cleaner indoor air? A WIN! Gerberas may bloom repeatedly with one flower at a time, but the greens will continue to grow throughout the year while indoors. Aloe Vera is a triple win: aloe is very helpful at improving indoor air quality, it is a pretty plant that’s super easy to grow, and it’s medicinally beneficial. As a desert plant, aloe requires very little care, but works hard to remove benzene from the air. Benzene is released from paints and cleaning products. Keep aloe in a sunny spot, and be careful not to over-water. Be aware, some cats love this plant and might try to play with it! Frilly and fun, ferns can be a great addition to your houseplant collection. These relatively low-maintenance plants bring a happy dose of green to all rooms. Ferns are notable for removing formaldehyde from surrounding air better than almost all other plants. Some ferns need full light, while others can do with medium bright light. Ferns range from fine and frilly to large and funky. Find your favorite fern for the room size and lighting conditions, and be sure to watch for leaf dropping or browning, which might mean you need to brush up on your care routine. Another pretty plant that helps us breathe better air. This is a larger-size plant that can make your living spaces much more green and healthy. NASA says this humble plant can improve your indoor air quality by as much as 60 percent, as it helps reduce mold spores and can absorb vapors from acetone. The Peace Lily has lovely white flower and dark green, broad leaves. This pretty and easy to grow plant is one of the few green things I’ve been able to keep alive in my home. Both of my plants were dug up from the forests outside Honolulu, and they have thrived over the years with minimal effort and in various conditions (outside, on a covered porch, and now indoors all the time. They grow prolifically, and periodically I trim them to keep their tendrils off the desk! This lovely green helps remove formaldehyde from the air. Here are some other ideas for bringing green goodness into your home for better indoor air quality. These funky little plants are becoming increasingly popular for their variety, odd colors and shapes, and their ease of care. Our friends at Crafting a Green World love succulents too. Becky says, “Once you establish [succulents], they’re pretty low-maintenance, and though they prefer direct sunlight they will do fine in a sunny window. Their low watering needs make them great little house plants.” Succulent is not actually a botanical term, but instead refers to any plant that are adapted to store water (that’s why succulents have those juicy leaves!). Depending on the variety of succulent you’ve chosen, care will generally require water once each week, but be careful to read any instructions that have come with your pretty little plants. The big concern for succulents is to be careful not to over-water, nor under-water. Succulents can survive in dry conditions, but will not thrive. Need to learn more? Check out this helpful resource for caring for succulents and cacti. They don’t seem to be correlated with any phytoremediation, but they sure are cute. 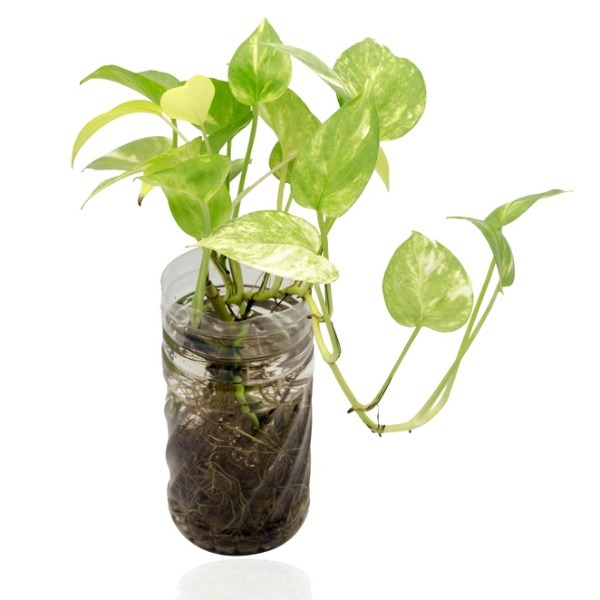 Terrariums are also pretty chic now, and add a great green feature to any room in the house. Plus, they are so cute and tiny, it makes a great gift or fun DIY project for kids big and small. Crafting a Green World has tutorials for making seven DIY terrariums featuring a variety of plants and containers. How about a teacup terrarium or a mini-rainforest terrarium? Kid-friendly, budget-friendly and so dang cute. How to care for your terrarium: Care depends on whether you’re growing moss, succulents or other plants. A basic rule is to water only when soil feels dry, and most experts recommend using a mister to make sure nothing gets too damp. If your terrarium is closed, be sure to let it air out once a month. This is for the more serious plant grower. An investment in a home aquaponics system that grows both fish and water is a really cool idea, but does require more maintenance. On Sustainablog, Jeff shares six cool ways to build DIY aquaponics systems, ranging in size from the very small, tabletop unit to a whole basement filled with fish and plants. A big task no doubt, but a full experiment for sure! All plant images from Shutterstock.